Timber sash and case windows should remain in good condition and will be capable of providing efficient service if they are regularly cleaned and maintained. Regular cleaning of the glass and timber surfaces will improve the appearance of sash windows and ensure they function correctly. Cleaning also presents an opportunity to inspect windows regularly. This will enable you to keep abreast of any developing defects so that corrective action can be taken before they can progress into more major problems. The majority of window sashes are counterweighted so that theycan be operated easily. Sashes are hung on cords which pass over pulleys and connect with eights concealed within the weight boxes in the hollow sides of the case. These cords require replacement when worn or broken from the frame. 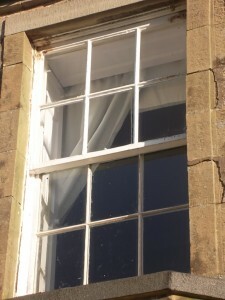 Straightforward design and construction of timber sections means that sash and case windows can be repaired readily – even the most dilapidated windows are usually capable of resurrection. 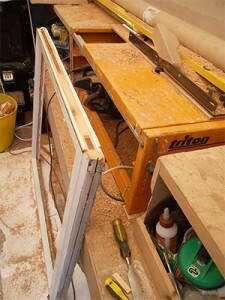 Most old sash and case windows were manufactured from exceptionally durable hardwood. It therefore makes sense to retain and repair original rather than replacing the window with a new timber which may be more susceptible to decay. Draught-striping can be fitted cheaply and unobtrusively to timber sash and case windows to bring them up to modern performance standards. It is a cost effective way of improving comfort and noise insulation and reducing heat loss and dust ingress. Where the building is listed, further advice should be obtained from your local planning authority planning department as to the sustainability of the draught-stripping proposals for historic windows. 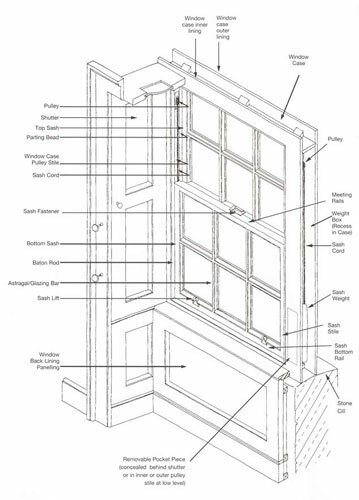 A typical sash and case window, including the terms used to describe parts of the window in this leaflet.